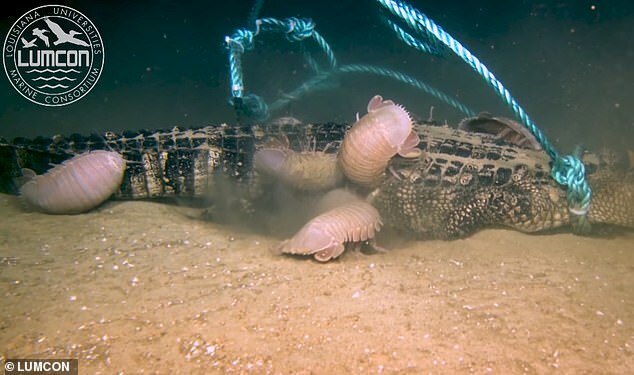 Isopods are a form of crustacean, arthropods distantly related to crabs and lobsters (and even more distantly related to centipedes, millipedes, insects and spiders). They even kind of vaguely resemble the ancient trilobites, an extinct form of arthropod that dominated the ocean floor for some 300 million years from the early Cambrian (when they were already highly diversified and seem to have had a history) to the Permian mass extinction when the last of them dissappeared. Some of today's isopods live on land. 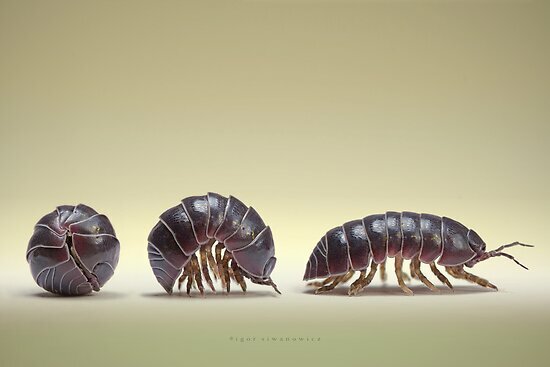 Most people are familiar with them, the little 'pillbugs' that roll themselves into balls when they sense danger. They've always seemed cute and harmless. Well, check out their relatives that live in the deep ocean darkness. They are pink and roughly football sized. They live as scavengers, eating whatever animals die and fall to the ocean floor. Biologists believe that this opportunistic-feeder ecological niche is what accounts for their size. They only get the opportunity to feed when something edible falls into their world. So they are large, with bodies filled mostly with fat. They are apparently able to go for months or even years without eating. But they have acute chemical senses that detect anything edible nearby. When they get the chance to eat they go at it, with mandibles that are like power tools. Is there anything alive, dead or inorganic that doesn’t get eaten? I’ve heard of microbes that eat radioactive material and I’m assuming something else dines on them. I’m awake early this morning and I hear my stomach growling so I can’t help but think now that some microscopic form of life is gnawing on me as I lay awake. This is hard to make out but it appears to be a giant isopod devouring a shark!